Is the Ayam Cemani Right for You? The Ayam Cemani eggs color, cockerel and hen have got a lot of folks talking over the past couple of years. It is a completely black bird- inside and out, so the Indonesian people have come to associate the bird with mystical or Dark Arts wherever it is seen. 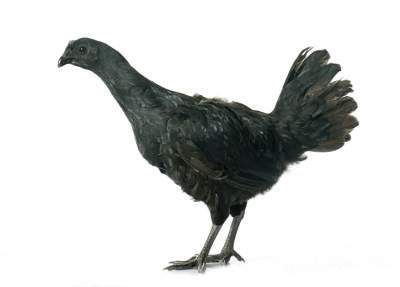 If you have an hobby of owning or collecting exotic looking chickens, you might want to add this black chicken to your collection. 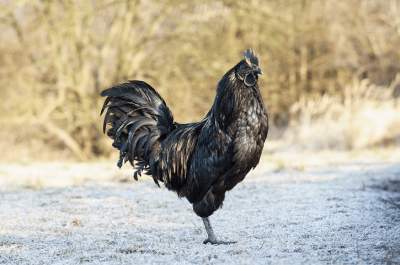 This black Indonesian chicken breed is a rare breed, and cannot be mistaken for another. It’s completely black, with feathers that have a metallic sheen. It’s skin is black, has a black beak, blacj feathers, and the roosters have a black comb. What’s even stranger? All of its internal organs and bones are black, too. In this article, we are going to take a look at these interesting and unusual bird temperament, pictures, price etc. and help you figure out if you need them in your flock! The Ayam Cemani is kind of a poor egg layer. Averagely, they lay around 80 eggs each year which is around 1 egg per week. They do seem to go “off lay” for a long period of time. Evidently, they will lay 20-30 eggs and then quite laying. This can last for as long as 6 months, and then they will begin the process all over again! 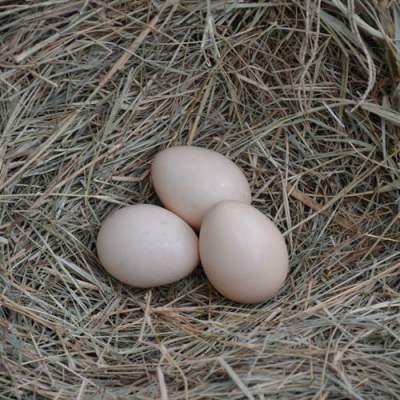 When compared to the size of the hen, the black chicken eggs are quite large and are cream colored with a small pink tint (not black). 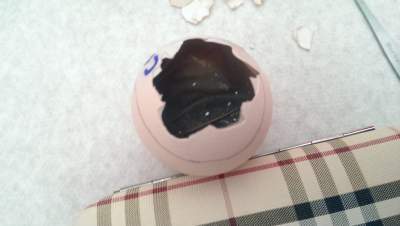 I have seen lots of photos that show black eggs- rest assured, those are nothing but fakes! Some chicken keepers argue that they’re broody and others say they are not. This may be as a result of the differences in blood lines obtained. They tend to make good mothers and care well for their black chicks hatched from eggs. The origin of the Ayam Cemani is kinda vague at least. Chances are, it has its origins from Sumatra where the original breed is almost out of extinction. This black bird is most times associated with a group of breeds known as Kedu, from the central plains of Java. It is believed to be an offshoot of the Ayam Bekisar chicken which lives on a small group of Islands in Indonesia. The Ayam Bekisar originated from matching the green jungle fowl with some domesticated jungle fowl. Now, this process was a tricky one as certain crosses will be infertile. Want to know the best part on Ayam Cemani eggs and breed care + info? This group of fowl has a very distinct crow, and was used by seafarers as foghorns on boats- a practice still used today. There is cponfusion in the name of the black bird: In Indonesian language, Ayam means chicken, but the name Cemani can either mean the “Village of Cemani” in local dialect or “solid black” in Sanskirt, you can pick whichever you want. It is said by some folks to be a landrace bird, but there is evidence that it was a developed breed at some point. It is not a “common chicken breed” as wealthy people and people of great affluence have these birds as status symbols and take great care of them. They are sought after for the good luck charm they bring (as believed by some people), with the chicken blood and other parts of the bird being used in preparing traditional medicine. The Ayam Cemani is said to have magical powers and can aid in the communication between the living and the dead world. As such, it is used as a sacrifice to please the gods to grant one access. It’s flesh is rarely consumed in Indonesia. A Dutchman named Jan Steverink imported them to Europe back in 1998. Ayam Cemanis are a striking sight. Covered in black feathers, it radiates a beetle-green plasmatic play of color in sunlight is absolutely stunning. They are not really an overly large fowl; the boys weigh around 4.5-6.5lb, with the hen weighing around 3.5-4.5lb respectively, so more of a medium sized bird. They are muscular and strong in appearance with close fitting feathers, not unlike a game bird. They strike a confident pose and are always at alert. The American Poultry Association has not recognized the Ayam Cemani. The US Ayam Cemani club is actively working on a standard of perfection for this breed. The standard description below is from the Dutch standard of perfection. The bird should stand upright, alert – almost ‘game-like’. The body is of slim, muscular, medium size, and firm. It will have a medium back which slopes from the neck and a fairly broad breast. The wings are strong and long arising from wide shoulders. The tail is held moderately high. Thighs are muscular and powerful. The bird should have 4 toes to each foot. All Feathers are black and are close fitting to the body. Comb, Skin, eyes, and wattles should all be black. No other color should be seen. The feathers can display a beetle-green to purple iridescence in sunlight. Generally, the Cemani has been reported to be a likeable and friendly bird. They are gentle, docile, and intelligent- including the roosters. They have been described as flighty, but a big number of people who have them say this is not so. They are a low maintenance and easy to handle fowl. They are kind of winter hardy- handling winter well when given the appropriate shelter and housing. Since they originated in Indonesia, you can agree that they will handle heat pretty well. I couldn’r find out any health problems with this particular chicken breed, but this is a great avenue to talk about fibromelanosis of the Ayam Cemani. The bird was a mutant fibromelanistic gene- a gene that deposits excessive black pigment. This abnormal accumulation of melanin makes the tissues and skin appear black. This genetic trait is only carried by three other birds- the Kadaknath – a chicken of the Madhya Pradesh region of India, the Svart Hona from Sweden, and the Silkie. The blood is red in color and is argued to be darker than normal although the bone marrow is back. In all other aspects the Ayam Cemani is a robust and healthy bird. It does not appear to be prone to any particular chicken ailment. If you would love to add these black beautiful birds to your flock, you had better save your pennies. An unsexed chick from them will cost you about $199.00 or a sexed juvenile is a whopping $400.00 – not for people who are “broke” or don’t like to spend much. Of coure, you can get cheaper birds but they are most times of lower quality. Described as friendly but really “cuddly”, so it is not a really lap chicken. They will eat feed from your palms so they are certainly not the stand-offish kind with people. A lot of people will purchase them as pets or to show off. The Ayam Cemani has been in existence for a hundred years or more but only came to limelight recently in the 1990s. Since that time, they have captured the imagination and the hearts of many admirers. The ongoing threat of Avaian influenza has contributed to the rareness of the bird. Most of the breeding stock comes from Indonesia, the US importation restrictions are harsh in order to try and prevent more outbreaks of the disease. We hope you can now identify Ayam Cemani eggs, breed and can care for them.